1. Way of approach, a means of reaching, passageway, entry: Switzerland has access to the sea by way of the Rhine River. 2. A way of getting to something or someone, admittance; entrance: The thief gained access to the safe in the store. 3. A sudden outburst or attack as of rage, disease, or emotion: Jeremy had a fit of passion which resulted in an access of fury or rage. 4. 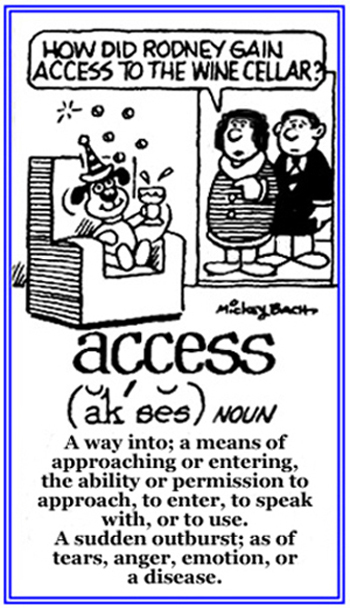 Etymology: from Latin accessus, "a coming to, an approach"; from accedere, "to enter upon"; from ac-, "to" (a variation of ad- before c + cedere "to move, to go"). © ALL rights are reserved. 1. To obtain information or data; especially, from computer: "A person usually can't access most of the data on a computer without having a password." 2. To go someplace and to be able to enter whatever it is: "Pete asked for a key to the office because he was planning to access the office after working hours to complete his report. 3. Entering, making an entrée: "The thief was accessing the vault while the political rallies were taking place."